Snowy Nutmeg Scented Geranium - Spicy nutmeg scent. Variegated green and white rounded frilly leaves. 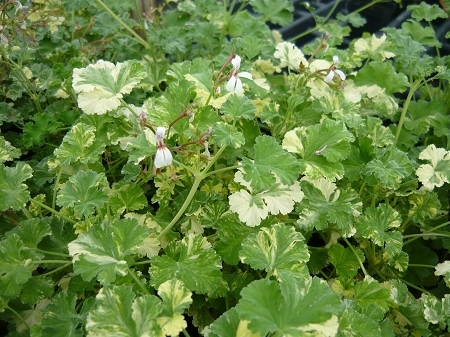 Nice rounded and compact growth habit makes this an attractive plant for hanging baskets and containers. Sprays of delicate white flowers when in bloom. Perennial zones 10-11+ Live starter plant in 3 inch container.